Turbowolf released their third studio album, The Free Life on March 16th, and shot off on a UK tour the very same day. The album was well-received and was highly praised by both fans and critics. Their live shows are renowned for being chaotic and filled with high-octane tracks. The tour they’ve just embarked on was their biggest UK one to date, and we headed down to their home town of Bristol to see them in action, alongside some other brilliant UK bands they took along for the ride. With melodic, artful rock Big Spring’s (6.5) set showcased their frontman’s impressive vocal range. Their sound is already defined and it was clear to hear exactly who Big Spring are. Despite struggling to connect with the small crowd gathered around the stage, they played an interesting set brimming with songs that were easy to get lost in. Their latest single, ‘Come Down’ included some beefier riffs, as did ‘On a Bamboo Sleeping Mat’. The band are in the process of finishing their debut EP, and have already been referred to as the best new band in Britain. It seems that 2018 is already shaping up to bring new bands to the attention of many, and Big Spring are certainly a small band worthy of your time. Puppy (7) introduced themselves with an onslaught of noise, a solid wall of bass and tempos and sounds that changed at breakneck speed. Right from the word ‘go’, they had the growing crowd captivated, with fans in the room showing that Puppy have a very diverse reach. Their huge tracks had heads bobbing appreciatively; ‘Entombed’ was a crowd favourite with its chunky guitar riffs and intricate solos. The three-piece made a proper connection with the crowd for this homecoming performance, and it was easy to see them headlining a venue not too dissimilar to the Trinity Centre. Releasing their new material less than a week before playing in their hometown of Bristol, the expectation was that Turbowolf’s (9) newer songs would fall a bit flat in terms of crowd response. While opening with ‘Capital X’ was a little shaky, as soon as the band launched into ‘American Mirrors’, the chaos that Turbowolf are capable of causing became apparent. Frontman Chris Georgiadis proved himself to not only be a brilliant musician, but a performer; the passion and energy that he puts into each song is commendable, and he does so well to entertain a crowd. The band made sure to play not only new material, but fan favourites and songs with big riffs that simply kill it live. 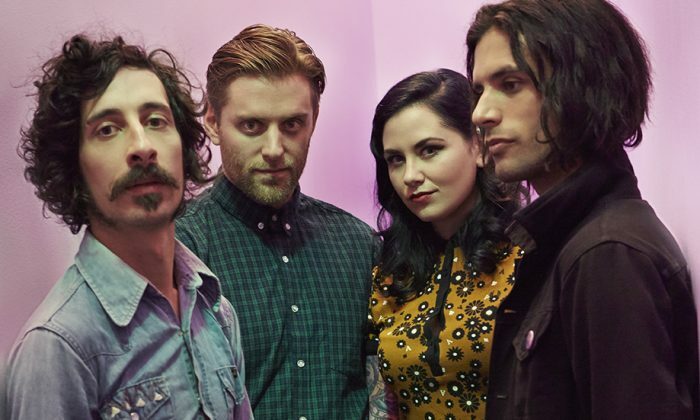 ‘Cheap Magic’, one of Turbowolf’s newest singles, was met with joy and enthusiasm – the room sang the words in unison and of course, it was impossible not to dance and jump around. There was pure joy on the faces of both the band members, and those in the audience, and as the band stormed straight into ‘Solid Gold’, it struck us just why people keep coming back to see Turbowolf. Passion and enthusiasm clearly fuel the band and, combined with excellent musicianship, their live shows are always something to remember. ‘Good Hand’ and ‘Very Bad’ saw controlled madness encouraged by bassist Lianna Lee Davies, before an atmospheric intermission let everyone calm down a touch. The mismatch of genres that inspire and influence Turbowolf meant that a relaxed, synth-heavy track could be played just as comfortably as one with groovy guitar riffs and obscure lyrics. Drawing their high-octane set to a close with ‘Rabbit’s Foot’ and ‘The Free Life’, Turbowolf’s hometown show was filled to the brim with excitement and a mutual love for the music.